The reinvention of the MINI brand continues apace with the launch of the all-new MINI Convertible. With major refinements against its predecessor, the car features a striking new design and significant enhancements to make open-topped MINI motoring even more dynamic, stylish and practical. Officially on sale in the UK from March 2016, it follows hugely successful model launches in 2004 and 2009. 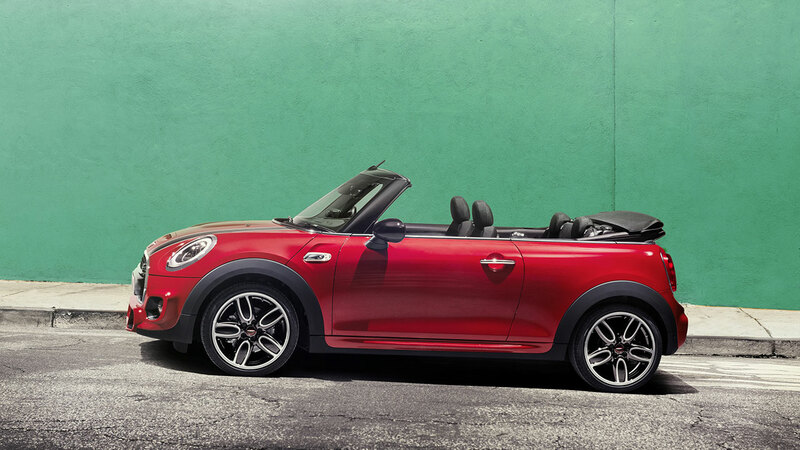 After 12 years of sales success, it remains the only premium soft-top four-seater convertible in the small car segment, and the UK continues to be the largest market worldwide for the new MINI Convertible. Brand new features include a fully electric roof that is quieter and smoother than the previous model, a fully integrated rollover protection system and more rear space than ever before. A striking new exterior and interior design ensures the new MINI Convertible is unmistakably MINI, whilst showcasing a blend of sporting flair and elegant dynamism. The all-new MINI Cooper Convertible and Cooper D Convertible are 3,821 mm long, with the MINI Cooper S Convertible 3,850 mm long. All models are 1,727 mm wide, 1,415 mm high and have a wheelbase of 2,495 mm. Those dimensions have increased compared with the outgoing model, with 98 mm extra length, 44 mm extra width and 1 mm extra height. The wheelbase is 28 mm longer and track width has also grown a further 42 mm at the front and 34 mm at the rear. The increase in dimensions has enhanced comfort levels and freedom of movement in all four seats. The two front seats have a wider range of adjustment, while rear passengers benefit from easier access, more headroom, a longer seat surface and improved lateral support. The design of the new rear more clearly defines the two individual seats. Day-to-day practicality has also improved. Smart design and interior packaging means luggage volume has expanded by around 25 per cent to 215 litres with the roof closed and 160 litres with it folded down. A high level of standard equipment across the range includes MINI Visual Boost Radio with a 6.5-inch screen, MINI Connected, Bluetooth connectivity with USB audio, Rear Parking Distance Control and a Reversing Camera. Personalisation is once again at the heart of the new MINI Convertible. Options include an industry-first Union Jack design woven into the MINI Yours fabric roof. There are two new exterior colours – Caribbean Aqua and Melting Silver – with a new Chester leather in Malt Brown available for the interior. 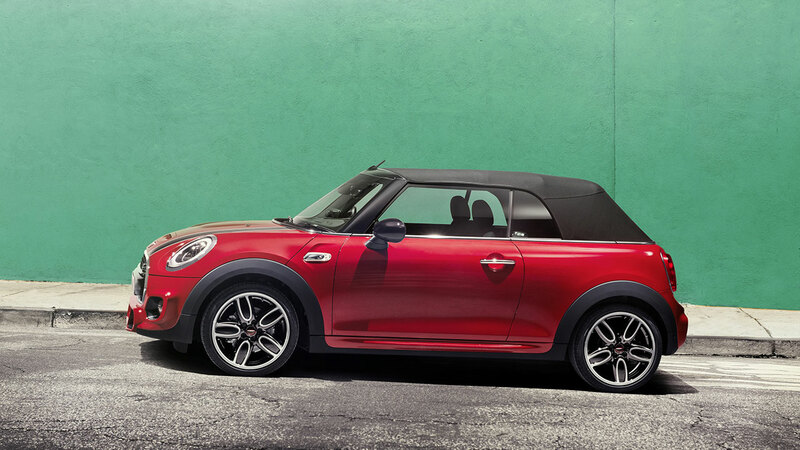 A three-car range will be available from launch – the MINI Cooper Convertible, MINI Cooper D Convertible and MINI Cooper S Convertible – with two petrol engines and one diesel. On-the-road pricing starts at just £18,475. The most important element of any convertible is its roof, and MINI has gone to great lengths to further improve the quality of this key component. Fully electric, the roof of the new MINI Convertible is suitable for year-round use and has been optimised for the very best heat and acoustic insulation. Quieter than ever before, when opened it folds neatly behind the rear seats. The front roof section can also be retracted by up to 40 cm, and this can be carried out at any speed. For a quick reaction to sudden changes in the weather, the soft-top can be opened and closed at speeds of up to 18 mph. The two operations are activated by means of a toggle switch on the front roof frame. When the vehicle is stationary, it can also be operated using a button on the remote key. Both operations take just 18 seconds. A button located in the driver’s door trim allows for simultaneous opening and closing of all four side windows. As an alternative to the standard version of the soft-top in black, a MINI Yours version is available for the first time with an integrated woven graphic. It’s an innovative and unique way to customise the new MINI Convertible. Based on the popular roof graphic from the MINI Hatch, the Union Jack motif is finished in a black and grey herringbone pattern. 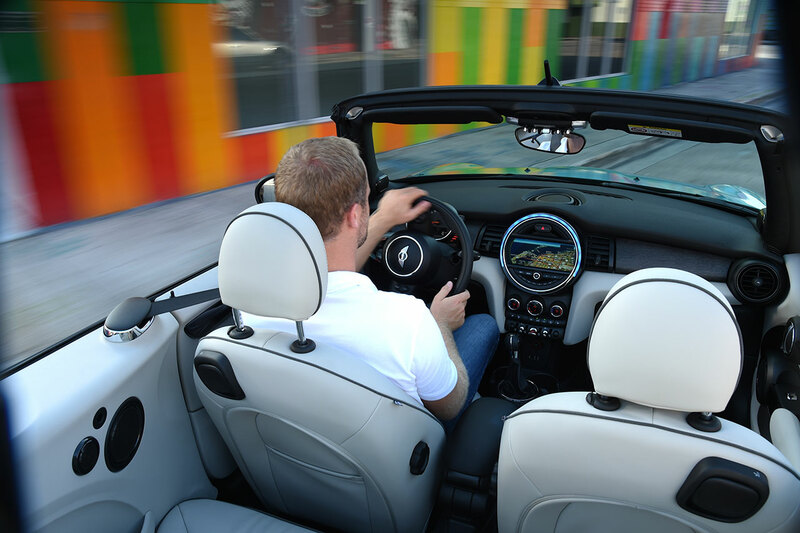 Safety is a critical consideration in open-topped cars and the new MINI Convertible includes new integrated rollover protection which extends automatically when required. Also improved is the optional wind deflector which can be locked into position behind the driver and front passenger seats so to provide protection from unwanted air turbulence during open-topped driving. After use it can be removed and stowed in the luggage compartment. Reflecting the styling changes already seen on the latest versions of the MINI 3-door Hatch, MINI 5-door Hatch and MINI Clubman, the all-new MINI Convertible showcases a blend of sporting flair and elegant dynamism. Emphasising the elongated silhouette, the chrome band that runs horizontally along the shoulder line, the short overhangs and the sculpted surfaces are all pure MINI. Family cues include the large circular headlamps with chrome rings, the hexagonal radiator grille, the ‘side scuttle’ indicator surrounds and black lower edging to the body panels. In conjunction with the optional Chrome Line exterior, the lower air inlet also features a chrome surround. On the MINI Cooper Convertible and MINI Cooper D Convertible, the ribs of the radiator grille and the bumper trim where the number plate sits are finished in high-gloss black. The performance credentials of the new MINI Cooper S Convertible are highlighted with an additional bonnet vent, and brake ducts in the lower air inlet. In addition, the chrome rib of the radiator grille bears an ‘S’ logo in red that’s repeated on the side scuttles. At the rear, the vertical light clusters feature chrome surrounds. Add in the tailgate handle strip, the distinctive bumper and the widening lower section of the body, and this car has all the MINI family signatures. The new MINI Cooper S Convertible can be identified by two centrally positioned exhaust pipes and a model-specific rear apron, complete with diffuser. The other engine variants have a rear fog light there instead. 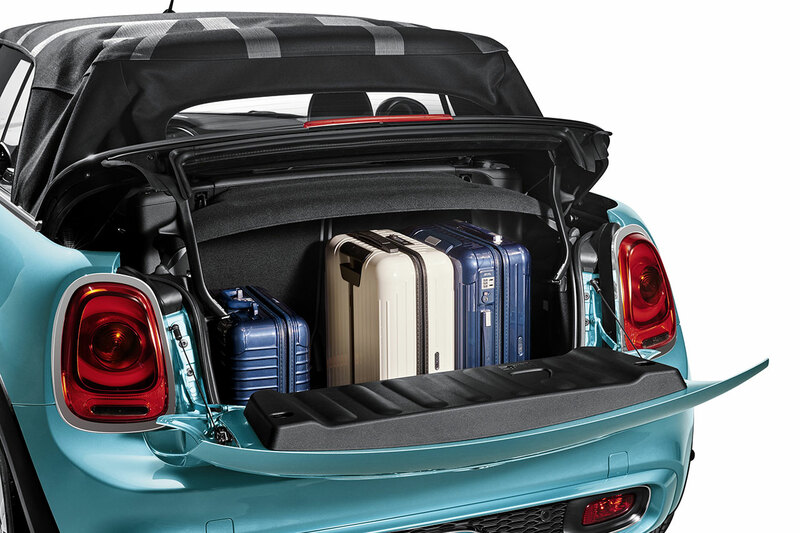 Boot volume of the new MINI Convertible is 160 litres with the roof open and 215 litres when it’s closed. Both figures are approximately 25 per cent more than its the predecessor. The tailgate opens downwards and can support a weight of up to 80 kg, for ease of loading. When the roof is closed, the luggage compartment opening can be expanded to stow larger items by means of the Easy Load function, which comes as standard. 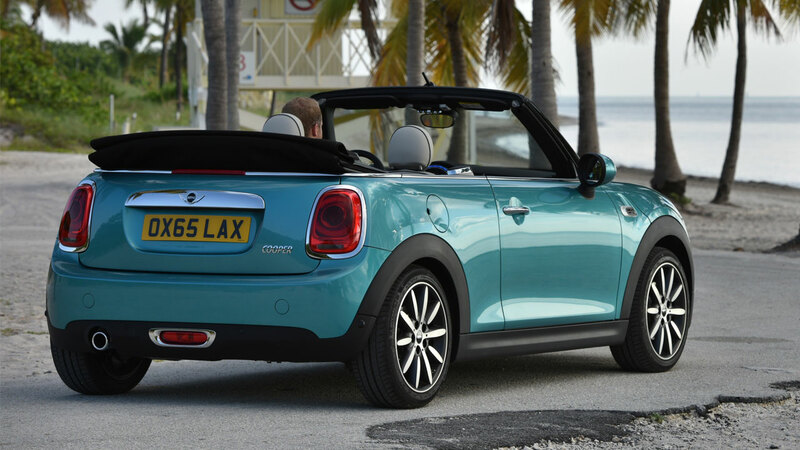 Two locking handles enable the roof frame to be swung higher up than in the previous MINI Convertible. For long loads, the car’s standard 50:50 split folding rear seat back rest makes life easier. The through-loading facility – widened by 8 mm to 734 mm – is ideal for items such as skis or snowboards. The selection of paint finishes on the new MINI Convertible has been extended on this new model. For the first time, Caribbean Aqua metallic and Melting Silver metallic are now available, in addition to seven other metallic and four non-metallic finishes. All can be combined with exterior options including Chrome Line exterior, mirror caps and bonnet stripes. MINI’s unique approach to cabin design showcases the best in contemporary styling, use of premium materials and high-quality workmanship. Nowhere is that better illustrated than in the new MINI Convertible, where a new Chester leather is available for the first time in Malt Brown colour. At the heart of the car’s appeal is increased space and comfort compared with the model. The extended adjustment range of the front seats ensures convenient entry and exit for rear passengers. Longer seat surfaces, increased headroom, extra shoulder width, extra elbow space, and more knee room (by 36 mm) all contribute to the enhanced rear. In the front, MINI’s characterful dashboard and instruments are as striking as ever. The horizontally structured cockpit matched with circular or elliptical contours for displays, air vents and door trim will all be familiar. Much-loved MINI elements such as the instrument panel on the steering column, large central display screen and red start/stop button at the centre of the dashboard are all present. In both the front and rear there are cupholders and storage spaces for small items and drinks. Bottles of up to 1.5 litres in volume fit in the two door pockets. A storage package is available as an option, consisting of storage nets for the luggage compartment and passenger footwell. A 12-volt socket in the luggage compartment is also included. For an interior design geared towards the customer’s own personal style, there is a broad selection of upholstery colours, interior surfaces, cockpit facia frames, lighting packages, and Colour Lines and Chrome Lines for the interior, including MINI Yours options. To ensure outstanding driving performance with exceptional efficiency, the latest generation of EU6-compliant engines are installed under the bonnet. The petrol engines inside MINI Cooper Convertible and MINI Cooper S Convertible – 1.5-litre three-cylinder and 2.0-litre four-cylinder respectively – feature turbocharging, direct fuel injection with centrally positioned injectors, variable camshaft control on the intake and exhaust side (double VANOS) and fully variable VALVETRONIC valve control technology. On the 1.5-litre diesel three-cylinder engine in the MINI Cooper D Convertible, there is turbocharging with variable intake geometry and common rail direct injection. Power is directed to the front wheels, with a six-speed manual transmission as standard. Offering increased efficiency, optimised acoustic and vibration response and enhanced shift comfort, a gear sensor enables active engine speed adaptation for especially sporty shifting when accelerating and increased comfort when shifting down. A six-speed Steptronic transmission is available as an option, also more efficient and refined than ever before. Steptronic sports transmission with steering wheel-mounted shift paddles can be specified on the MINI Cooper S Convertible. It offers reduced shift times, and features a Launch Control function for traction-optimised acceleration from a standing start. Both automatic variants have a transmission control system that is able to draw on navigation data to aid gear and shift-point selection. MINIMALISM technology is fitted as standard across the range, including an auto start/stop function in conjunction with both manual and Steptronic transmissions, brake energy recuperation, shift-point display and electro-mechanical power steering. In addition to the map-controlled oil pumps, needs-based control of the fuel and coolant pumps also contributes to the efficiency of the engines. An optimised preheating process reduces the energy required to start the diesel engine in the MINI Cooper D Convertible by around 50 per cent. Extensive underbody panelling optimises aerodynamic performance. The optional MINI Driving Modes enable individual vehicle set-up by means of a rotary switch at the base of the gear lever. In addition to the standard MID mode, there is a choice of SPORT and GREEN. Adjustments influence the characteristic curves of the accelerator, steering and – if the car is specified accordingly – the shift characteristics of the Steptronic transmission and the Dynamic Damper Control program map. In SPORT mode, the overall set-up is geared towards active driving fun, while GREEN mode supports relaxed and fuel-efficient driving. For example, in Steptronic cars it’s possible to use the ‘coasting’ function, where the drivetrain is decoupled at speeds of between 31 and 99 mph as soon as the driver’s foot is removed from the accelerator pedal. The increase in wheelbase and track width over the outgoing model has provided an ideal starting point for the driving dynamics of the all-new MINI Convertible. The combination of single-joint strut front axle and multi-link rear axle – unique in the small car segment – and a convertible-specific set-up means the car is exceptionally agile but also supremely comfortable on all road surfaces. A sports suspension, which is geared towards even more dynamic driving, is available as an option on all models. The electro-mechanical power steering includes speed-related Servotronic support for maximum precision during cornering and for comfortable manoeuvring at low speeds. A new option, available for the first time on the MINI Convertible, is Variable Damper Control. Two program maps are available to choose from, allowing the MINI Driving Modes to be used to activate either a comfort-oriented or a sporty response. The MINI Cooper Convertible and MINI Cooper D Convertible are fitted with 15-inch light alloy wheels as standard. 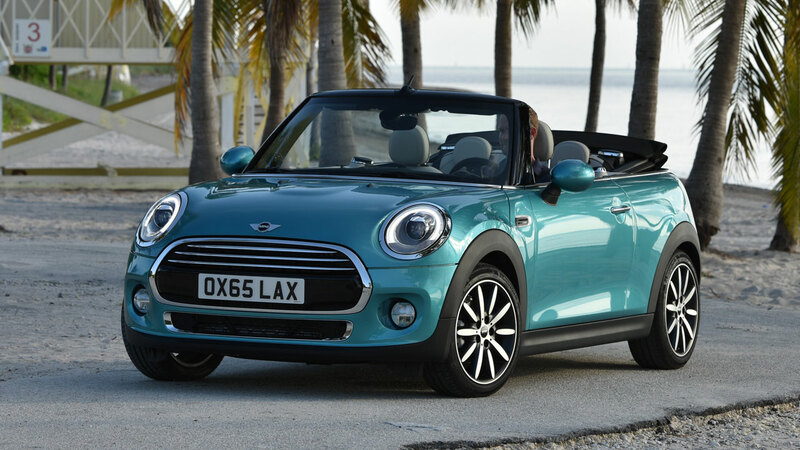 The MINI Cooper S Convertible comes with 16-inch light alloy wheels. Optional extras, in sizes from 16 to 18 inches, can be specified by the customer. In addition to the ABS, electronic brake force distribution (EBD), cornering brake control (CBC), and the brake assistant, the standard-fit driving stability control system (DSC) also includes a drive-off assistant, a brake dry function, fading brake support and dynamic traction control (DTC). This latter system permits controlled slip for driving off in loose sand or snow. Enhancing the driving stability control system (DSC), and active even when DSC is turned off, there is an electronic locking function for the front axle differential known as the electronic differential lock control (EDLC). This selectively brakes a spinning drive wheel on tight corners, redirecting torque to the other wheel. A standard feature in the MINI Cooper S Convertible, performance control supports agile steering for dynamic cornering prior to reaching the threshold level. The agile, highly predictable and secure driving offered by the new MINI Convertible is due to its highly rigid body structure. The convertible-specific elements which increase stiffness include torsion struts in the front and rear area of the underbody, selective optimisation in the area of the side sills and a stiffening plate underneath the engine. In addition, the new MINI Convertible is fitted with a rollover protection system with actuators connected to the car’s safety electronics. For the first time, the rollover protection elements are integrated and completely invisibly. As soon as the car detects the risk of a rollover, two protection bars made of high-strength aluminium retract within 150 milliseconds by means of a pyrotechnical trigger. Combined with the convertible-specific reinforced windscreen frame, this forms a stable survival space for vehicle occupants. Additional standard safety features include front airbags, side head-thorax airbags integrated in the backrests and three-point automatic belts on all seats. These include belt tensioners at the front, plus ISOFIX child seat mountings at the rear and for the front passenger seat. A tyre pressure display for each individual wheel is also fitted as standard. Meanwhile, a partially active bonnet, impact absorbers and precisely defined deformation elements ensure optimised pedestrian protection. MINI’s suite of driver assistance systems are second to none, and many are showcased on the new Convertible. They include park distance control (PDC) with rear sensors and rear view camera as standard, and front sensors as an option. Parking Assistant is also available as an option. The Driving Assistant option comprises a camera-based cruise control and distance control system, as well as collision and pedestrian warning with initial brake function. It also includes road sign detection for speed limits and overtaking bans, plus high beam assistant. New to the MINI Convertible is MINI Head-Up Display. The system projects driving-related information on to an extendible display in the upper area of the instrument panel. There it can be read quickly and conveniently without the driver having to avert their eyes from the road. Standard across the range is air conditioning, central locking with keyless engine start and MINI Visual Boost Radio with AUX-In and USB socket. Two-zone air conditioning with an automatic convertible mode is available as an optional extra. Others options include a sports steering wheel (standard on the MINI Cooper S Convertible), heated front seats, a visibility package including windscreen heating, a rain sensor with automatic driving lights control, Comfort Access, a Harmon Kardon hi-fi speaker system, plus heated/folding exterior mirrors. A new digital version of the Always Open Timer, which registers the time spent driving with the roof down, is also on the options list. In addition, there is a MINI Yours sports steering wheel with a soft nappa rim and hand-stitched seams, as well as sports-oriented John Cooper Works options. These include an aerodynamics kit, leather steering wheel and sport seats. A host of new exterior lighting options are available on the car, including all-LED lights, the addition of adaptive light distribution geared towards driving situation and road layout, plus an LED turning light. Inside the car, the optional LED lighting package creates a sophisticated ambience. The MINI Excitement Package includes a downwards projection of the MINI logo from the exterior mirror on the driver’s side, activated when the car is unlocked. Customers wishing to add extra spice to their MINI Convertible can choose to add a Chili pack to their car. Containing some of the most popular optional extras, such as LED headlights and daytime running lights, Interior lighting pack, Automatic dual-zone air conditioning, cruise control, MINI Excitement pack and much more, Chili pack helps MINI Convertible customers to get more MINI for their money. New from MINI Connected: MINI Streetwise and rain warning function. MINI Visual Boost Radio and MINI Connected are standard across the range, with MINI Navigation System and MINI Navigation System XL, featuring a gorgeous 8.8 inch colour display, available as an option. MINI Connected offers extensive integration of smartphones in the car, allowing access to infotainment, communication and driving experience apps. The MINI Connected app comprises new and exclusive functions to increase comfort and driving pleasure in the MINI Convertible. For example, Streetwise is available for the first time, providing the driver with tips for the optimum route before the journey gets underway. 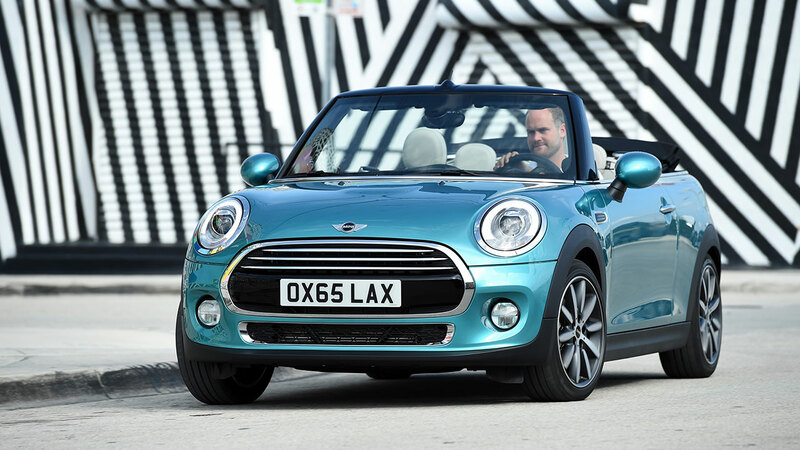 A SIM card can be fitted permanently into the new MINI Convertible. This means Intelligent Emergency Call with automatic detection of vehicle location and accident severity is available, as well as MINI TeleServices. The optional Media XL Pack includes both MINI Navigation XL and MINI Connected XL with the Journey Mate function. This helps the driver plan routes, as well as providing personalised information while travelling. It also features a real-time traffic radar function with highly precise and up-to-date traffic information. Another new feature incorporated into MINI Connected XL, developed especially for the MINI Convertible, is the ‘rain warner’ function. If the vehicle is parked with the roof open and the forecast is bad, the driver is sent a message via their smartphone suggesting that it might be time to close up. If the MINI Convertible is being driven and there is rain forecast ahead, the driver will be alerted on the centre console. Additionally, if the car is travelling over 30 mph, MINI Connected XL will suggest possible places to pull over and close the roof.